Thought for the day: Some Creative Math Prompts are problems without directions! Students’ first job is to predict the "hidden" question. However, they may also come up with other ideas! I notice that all four numbers in the picture are even. I notice that all three rows are the same. I notice that there are four circles between the 64 and the 2. I wonder why there are three copies of the same thing. I wonder if it is possible to turn 64 into 2 using only x 4 and ÷ 8. I notice that 64 is divisible by 8, so that might be a good thing to try first. I notice that multiplying by 4 and then dividing by 8 always has the same answer as dividing by 2, no matter what number I start with. I wonder how many ways I can turn 64 into 2 using only x 4 and ÷ 8. I wonder if it is okay to put fractions in the circles. I wonder if I can do it backwards (turn 2 into 64). Create their own strategies for multiplying and dividing large numbers or fractions by 4 or 8. Create ways to organize their answers so that they can look for patterns. 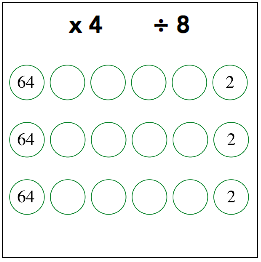 Create new problems like this one by changing the numbers 4 and 8, changing the number of circles, or changing the numbers in the first and last circles. For all new problems they create, they can try to find all of the solutions, look for things that the solutions have in common, explain how they know they have found them all, and explain why some of their problems have many solutions and some have none. I notice that all of the solutions involve multiplying by 4 twice and dividing by 8 three times (in different orders). I notice that there are 10 solutions to the original problem. I notice that all of the numbers in the circles are even numbers (or fractions equal to 1 over an even number). I notice that it is hard to create other problems like this that have so many solutions. I wonder if I can find solutions to the reverse problem (turning the last number into the first one). I notice that I can predict the solutions to the reverse problems from the solutions to the original problem. I notice that all of the numbers in this (original) problem can be produced by multiplying or dividing repeatedly by 2 (powers of 2). I wonder if I can create a problem like this based on multiplying and dividing by 3. This Creative Math Prompt is part of an extended activity called Hopping Home on the Deep Math Projects page of this website. Some teachers and students may notice that the prompt reminds them of a format commonly known as "frames and arrows." The details are different, but students' task is to turn the left number (64) into the right number (2) using only the two operations. The goal is to do it in five steps, inserting the temporary answer in the circle each step of the way. Most students will divide by 8 first (64 ÷ 8) in order to work with a smaller number. In fact, although there are 10 solutions to the problem, most students will produce the same two or three answers. For some students, this may be enough. For additional challenges, they may make more copies of the problem and search for as many solutions as they can find. Some of the solutions involve three-digit numbers in the thinking process, and others involve fractions. Don't worry if students have not been taught how to handle these kinds of calculations. Let them use their number sense to develop their own strategies as they are able. For example, 1 ÷ 8 is different than 8 ÷ 1. 1 ÷ 8 involves dividing 1 into 8 equal parts. How large is each part? (1/8) There is no need for you to teach processes for dividing fractions in order for them to discover this answer! They simply need to think carefully about what division means. This prompt is easy to extend by asking new questions. Use more or fewer circles. Use numbers other than than 4 and 8. (There may often be no solution. Figuring out why is a great challenge!) Choose different starting and ending numbers. Think about how you can know when you have found all possible solutions! Keep in mind that, while I meant for the prompt to suggest a particular problem, students may have other ideas. Follow up on their responses! When a student suggests a certain task, it is likely to be (1) something they will be interested in, and (2) something that they are prepared to learn from.